Who invented Nylon? The name of the person credited with inventing Nylon is Wallace Carothers (1896 - 1937). Wallace Carothers is not only famous as the American inventor of Nylon, the world's first totally synthetic textile fiber, but also as a chemist, researcher and entrepreneur. When was Nylon invented? Wallace Carothers invented Nylon in 1935, during the Interwar period of invention (1918 - 1939). Definition of Nylon: Nylon is defined as a silky, man-made thermoplastic material (high-strength, resilient synthetic polymers) used to make yarn, fabrics and can be formed into bristles. Nylon stockings are the most famous item made from this materials but numerous other products are made from nylon including Guitar strings, Parachutes, Umbrellas, Kites, Toothbrushes, Dog collars, Toilet brushes, Racket strings, Fishing lines, Windbreakers, Medical implants, Camping tents and Children’s toys. Fact 1: Who invented Nylon? The Nylon was invented by Wallace Carothers in 1935 during the Interwar Era of inventions (1918 - 1939). Fact 2: Who invented Nylon? Prior to the invention of Nylon in 1935, chemists had learned that many materials were polymeric (a polymer is a very large, chain-like molecule made up of monomers, which are small molecules). Fact 3: Who invented Nylon? One synthetic polymer, the plastic known as Bakelite, had been produced by Leo Hendrik Baekeland (1863 - 1944) in 1907. Wallace Carothers went on to invent a versatile and durable first form of plastic called Nylon. Fact 4: Who invented Nylon? Wallace Carothers was the brilliant chemist who went on to invent a versatile and durable first form of plastic called Nylon. Fact 5: Who invented Nylon? The inventor of Nylon, Wallace Carothers, was born on April 27, 1896 in Burlington, Iowa, United States and died on April 29, 1937. Fact 6: Who invented Nylon? The early years of Wallace Carothers were spent in Burlington, Iowa, United States where he was raised by his family. His father was Ira Hume Carothers and his mother's name was Mary Evalina Carothers. He was the eldest of four children. Fact 7: Who invented Nylon? Wallace Carothers was educated at Capital City Commercial College in Des Moines, Iowa, studying accountancy but went on to attend Tarkio College in Missouri to complete a bachelor’s degree in chemistry. Fact 8: Who invented Nylon? Following his education his first job was teaching at the University of South Dakota. He gained his doctorate in 1924 at the University of Illinois and in 1926 he became a tutor of organic chemistry at Harvard. Fact 9: Who invented Nylon? Wallace Carothers had began research in polymers at Harvard when, in 1928, he was recruited to work at the new DuPont laboratory for fundamental research. Fact 10: Who invented Nylon? Polymer science was still in its infancy and Wallace Carothers headed the program in organic synthesis and began to study the structure and synthesis of polymers and conduct experiments to form long, macromolecular chains. Fact 11: Who invented Nylon? The patent for the process for creating Linear condensation polymers was filed on July 3, 1931 and patent number US 2071250 was granted to Wallace Corothers on February 16, 1937, the assignee was Du Pont. Fact 12: Who invented Nylon? 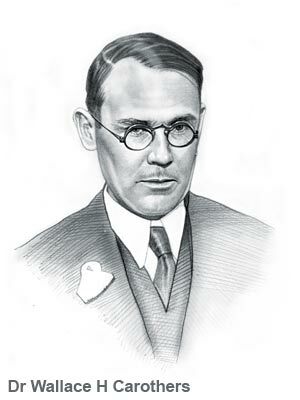 His work at DuPont enabled Wallace Carothers to confirm the existence of molecules of extremely high molecular weight and led to the development of neoprene and of nylon, the first totally synthetic fiber used in consumer products. Fact 13: Who invented Nylon? The invention of the artificial fibre Nylon was essentially like a long, thin fiber of plastic. It was fabricated when the appropriate monomers (the chemical building blocks which make up polymers) were combined to form a long chain via a condensation polymerisation reaction. Fact 14: Who invented Nylon? The monomers for nylon 6-6 were developed using equal volumes of two solutions - adipic acid and hexamethylene diamine from which strands of nylon were formed. The process for making Nylon was developed on February 28, 1935 by reacting adiponitrile, hexamethylenediamine in a condenser. Fact 15: Who invented Nylon? Both of the raw materials used could be made from benzene which was readily available from coal. Nylon was therefore prepared wholly with materials readily derived from coal, air and water and produced a silk like quality. Fact 16: Who invented Nylon? On February 21, 1936, Wallace Corothers married Helen Everett Sweetman of Wilmington, Delaware. His marriage was sadly short lived. In 1937, Wallace's sister had died suddenly and her death cast Wallace into a deep depression. The depression ultimately resulted into his suicide. Fact 17: Who invented Nylon? Wallace Carothers died on April 29, 1937. His daughter, Jane, was born on November 27, 1937, after the death of Wallace Carothers. Fact 18: Who invented Nylon? In 1938 DuPont started building its first nylon plant in Seaford, Delaware and the invention of nylon, was announced to the public by Charles Stine of Du Pont in New York City on October 27, 1938. Fact 19: Who invented Nylon? The company targeted the newly invented nylon at the hosiery industry. Because of nylon's silk-like qualities it was perfect for producing stockings. The stockings were an immediate sensation when they were demonstrated at the 1939 New York World’s Fair. Fact 20: Who invented Nylon? The first day nylon stockings were introduced across the United States on May 15, 1940, nearly 800,000 pairs were sold. Fact 21: Who invented Nylon? WW2 (1939 - 1945) broke out in Europe and when the United States entered WW2 in December 1941 all output was commandeered to meet military needs. There was a shortage of natural materials and served as a substitute for silk in products such as parachutes. The invention of nylon therefore played a vital part in the war effort. Fact 22: Who invented Nylon? After WW2 other products made from nylon came on the market including Guitar strings and picks, Racket strings, Umbrellas, Toothbrushes, Dog collars, Fishing lines, Medical implants, Camping tents, Kites and Children’s toys.